ZIMBABWE – Zimbabwe president Robert Mugabe, who last year became the world’s oldest head of state, recently celebrated turning 92 with an estimated $1 million dollar bash broadcast live on local television. Organizers said that 50,000 people attended the party, which was held in a large tent at the Great Zimbabwe ruins in Masvingo, a Unesco world heritage site that was built between the 11th and 15th century and functioned as an international trading hub. Mugabe has been Zimbabwe’s leader since its independence from Britain in 1980 and has said that he plans to rule the country until ‘God says come.’ His birthday has become akin to an annual political festival in Zimbabwe. Nicknamed the “21st February Movement” for his birth date, the event provides an opportunity for party loyalists to jostle for power and patronage. In the last two decades, Zimbabwe has gone from being a post-colonial success story marked by progressive social policies and attempts at reconciliation with the formerly ruling white minority; to a pariah state, wrecked by political and economic turmoil, land seizures and hyperinflation. Mugabe’s most recent festivities took place during the country’s worst drought in more than two decades. The government has appealed for nearly $2.25 billion to help pay for grain to alleviate an impending humanitarian crisis and in February declared a state of disaster. 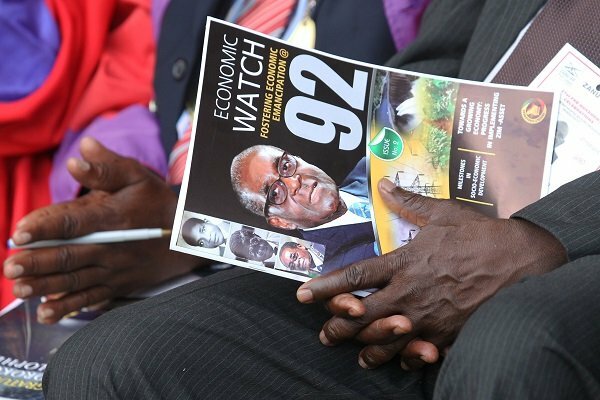 In an address to the local press, members of Zanu PF likened Mugabe’s birthday to that of Jesus Christ, “who was born to rescue us, the same way President Mugabe was born in 1924 to free all of us.” The party’s youth branch is campaigning for the day to be adopted as a public national holiday enshrined in the country’s constitution. To critics and opposition politicians, Mugabe and his party are out of touch with the daily struggles of the country’s 14 million people. But despite past attempts at political change and persistent rumors about his ailing health, he has continued to maintain his grip on the country. Some insight into the roots of Mugabe’s power can be gained from late Zimbabwean political scientist Masipula Sithole’s 1979 seminal book Zimbabwe: Struggles within the Struggle. In his ascendance to leadership, Mugabe cleverly sowed discord among the ranks of Zanu PF, clearing the way for himself. Deceptively charming and eloquent, the highly intellectual Mugabe was a godsend for Zimbabwe’s liberation movement. Since then, he has outlasted his opponents by being cunning and manipulative, skillfully playing members of his party off one another. Meanwhile, Zanu PF has successfully created a facade of support at rallies using a carrot and stick strategy, explains Harare-based journalist, Andrew Kunambura. Young and unemployed people are coerced to attend under threat of violence, while others go willingly for a chance at a free meal. To complicate matters, the Zimbabwe constitution is also very ambiguous about succession. “The procedure of selecting a successor is left entirely in the hands of the party in power,” explains University of Kent law professor Alex Magaisa. “And the (Zanu PF) constitution itself does not prescribe the procedure of selection for a successor,” Magaisa says. Mugabe’s seemingly interminable rule has left the country in limbo, with an intensifying succession battle distracting from governance deficits, political violence, corruption, electoral reform and human rights violations. Two possible successors have emerged: divisive Mugabe-ally and vice president Emmerson Mnangagwa, considered to be the architect of a number of violent campaigns against dissenting voices in Zimbabwe; and Mugabe’s wife Grace, 40 years his junior. After recently obtaining a PhD three months after registering at the University of Zimbabwe, she has since assumed Promethean powers to make or break political careers. Zanu PF has refused to allow open debate on succession, and other individuals named as likely replacements have been publicly humiliated, expelled from the party or the subject of negative attacks from within its ranks. For now, Mugabe keeps the world guessing on who is to succeed him, even in the twilight of his controversial political career.